Just because something is a cliché doesn’t mean it can, or should be, ignored. Here are six clichés we can use to help us become better project managers. We’ve all heard this expression. The lesson behind this cliché, is that patience is a virtue at the start of your project. Don’t rush straight into solution design and build before you’ve done the groundwork. Take time to create a good plan, gather customer requirements, and create solid functional and technical specifications. Remember, it is plan and then execute – not – execute, stop, plan and execute again. This is a modern cliché that I used as the title of an article about the common pitfalls of IT project management. 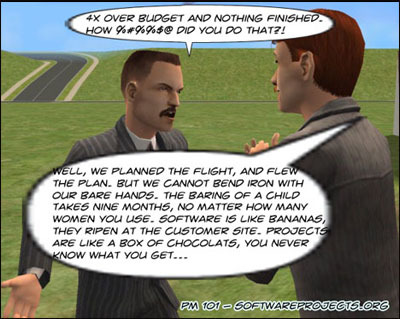 The lesson is that project management really isn’t rocket science. Projects are delivered using a clearly defined framework. The phases of a project are well documented, and once understood; provide a recognised route to project success. Take one of the many public training courses to find out how to deliver your projects successfully. This common business cliché is trotted out countless times a day in offices throughout the land; however, it is the number one activity of a project manager. The lesson behind this cliché, is that failing to manage expectations can lead to wrong assumptions and false hope. Having a good grasp of customer needs, will help ensure you are working to keep your project on track, and not chasing pots of gold at the end of the rainbow. Have you managed your customers’ expectations, or are they running wild? Although, not heard much these days, this cliché was a firm favourite of my boss as a young trainee Operations Manager. It means there are too many managers and not enough people to do the work. You need to ask whether you have enough people with the correct skills to deliver your project successfully. Not having the right number of people, or indeed having the right number with the wrong skill mix can be a cause of project failure. I find that I’m kept in the ‘loop’ for far too many things these days, many that don’t concern me. However, the lesson to learn from this cliché, is that stakeholder communication is an important contributor to project success. Keeping everyone well-informed (in the loop) ensures there are no nasty surprises at the end of your project. Communication problems are the hardest to resolve, as often it is only when looking back you see them. Regular communication and working closely with your stakeholders will help. Keeping these tips in mind as you manage your project, will help you keep expectations in line, your project running smoothly, and move you closer to getting the result you want. What are your favourite clichés?